MANILA, Philippines - (Updated as of 9:45 p.m. May 14) The long wait is over. The Commission on Election (Comelec) partial and unofficial results of May 2016 national elections - presidential race have been released as voting close on Monday at 5pm (May 9). Aspiring candidates for the 2016 Philippine presidential elections. The 16th president of the Philippines and the successor of President Benigno Aquino III will be announced in the coming days once the official canvassing of votes started. Davao City Mayor Rodrigo Duterte maintained a wide lead in the presidential race as of 9:45 p.m. (May 14). The data was sourced from the Comelec transparency server. 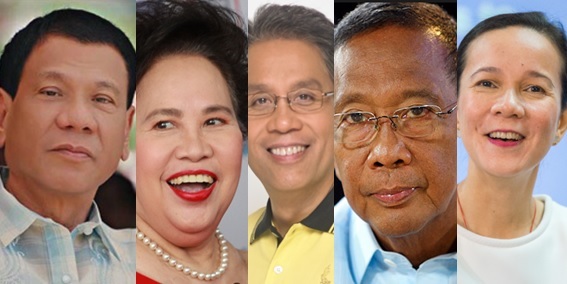 On this page, you will find the updates on latest vote tally for the 5 presidential candidates: vice president Jejomar Binay (UNA), Senator Miriam Defensor Santiago (PRP), Davao Mayor Rodrigo Duterte (PDP–Laban), Senator Grace Poe (Independent) and former DILG secretary Mar Roxas (Liberal). Check out live updates for Comelec partial and unofficial election results for presidential race on widget below. In the final SWS pre-election survey, Duterte holds a clear lead over his rivals or 33-percent would vote for him as president. The Davao Mayor has 11 percentage points ahead of his strongest opponent, independent candidate Grace Poe. On Monday, the candidates casted their votes on their respective polling precinct. According to Comelec, more than 40 million voters are expected to report to 92,000 precincts across the country to cast their ballots in the country’s second automated presidential election. Based on Comelec rules, the candidate with the highest number of votes wins the presidency. In case when two or more candidates have the highest number of votes, one of them shall be chosen by the vote of a majority of all the members of both Houses of the Congress, voting separately. The canvassing of votes for the presidential race is the sole jurisdiction of Congress sitting as the National Board of Canvassers, according to the poll body. The Congress is given not later than thirty days after the day of the election to canvass results from all provinces, independent cities that have their own legislative districts, diplomatic posts, and local absentee voters. The next president shall be inaugurated on June 30, 2016. The May 2016 election is the country's third automated polls after the 2010 (presidential) and 2013 (senatorial) polls. When voting close on Monday, the vote counting machines (VCMs) transmit the vote counts – also known as election returns or ERs – to the different servers and canvassing centers in the AES. From the VCMs, the election returns (ERs) are transmitted to the central server, to a transparency server, and to the municipal board of canvassers (MBOC). From the MBOC, the results are transmitted to the provincial board of canvassers (PBOC), where the results are collated and then transmitted to the national board of canvassers (NBOC), where the results for national positions are canvassed. The MBOC and PBOC also separately beam ERs to the central server. Like us on Facebook, Follow us on Twitter or subscribe to our email list to receive real-time results.